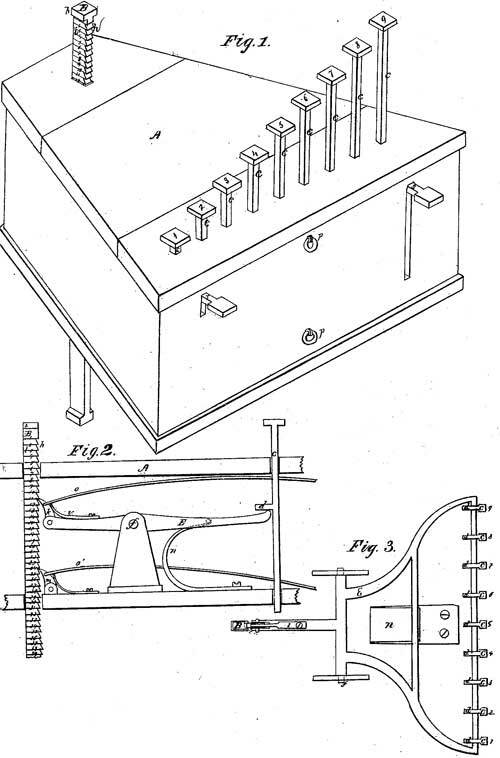 In 1850 Du Bois (Dubois) D. Parmelee from New Paltz, state of New York, received the US patent №7074, for a single column key-driven adding machine. This is the fourth (known to us) key-driven adding machine in the world, and compared to the previous three machines of James White, Luigi Torchi and Jean-Baptiste Schwilgué, it seems rather primitive. Nevertheless Parmelee deserves our attention, because he put the foundation of the US key-driven calculating machines industry, which will become the leading in the world industry some 50 years later. Dr. Du Bois D. Parmelee, a well-known at his time chemist and inventor, was born in Redding, Connecticut, in 1830. After attending a private school in Boston, he was sent to the University of the City of New York (State University of New York at New Paltz), where he received in 1858 a Master's degree in medicine and chemistry. He never worked as a physician however, but devoted his life primarily to experimental chemistry. He invented the cold process of manufacturing rubber and had a rubber business in Salem, Mass. He is also the inventor (U.S. Utility Patent №37637) of a suction socket for artificial limbs, some 90 years before it received general acceptance. Parmelee fastened a body socket to the limb with atmospheric pressure, thus being not the first person to do so, but the first person to do so with satisfactory results. Parmelee's company produced the first aluminium in USA. Parmelee was one of the most active members of American Institute and many exhibits of his inventions have been made there. He is a holder of many patents, primarily in the fields of rubber manufacturing and implementation. Dr. Du Bois D. Parmelee died of heart failure on April 18, 1897, in New York. The adding device of Parmelee (see the lower patent drawing) has 9 keys, which are numbered from 1 to 9 and have increasing heights. The motion from the keys is transferred to the stick (graduated rule) B in the back part. This stick has in his front part teeth, which are engaging with the 2 tongues m and k (figure 2 from the patent drawing). The sidebar of the stick is graduated and numbered in such way, that 1 tooth corresponds to 1 division. On pressing of a key, the lever E will raise the tongue k to so many divisions, according to the digit, written on the key. Then the lever will be returned to the starting position by means of the spring n. When the entering of the numbers (or the stick will be raised to the uppermost position), the operator can see the number in the sidebar, and then pulls by means of the 2 ropes p the 2 tongues and stick will fall down. It's obvious, that if the machine of Parmelee was ever used to add with, the operator would have to use a pussyfoot keystroke, otherwise the numeral bar would overshoot and give an wrong result, as no provision was made to overcome the momentum, that could be given the numeral bar in an adding action. In the patent description Parmelee also proposed some improvements, the most important is to improve the visualization, including in the construction gear-wheels and strips.